Western blot analysis of extracts from various cell types using Argonaute 2 (C34C6) Rabbit mAb. 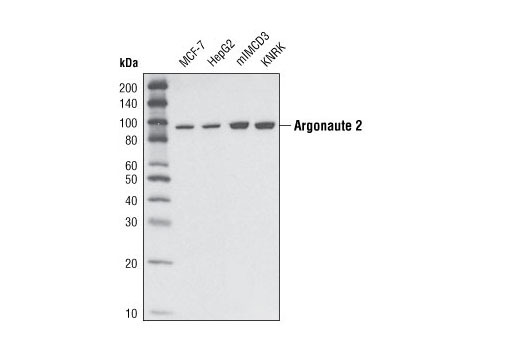 Argonaute 2 (C34C6) Rabbit mAb detects endogenous levels of total Argonaute 2 protein. Monoclonal antibody is produced by immunizing animals with a synthetic peptide corresponding to mouse Argonaute 2. Small non-coding RNAs are important regulators of gene expression in higher eukaryotes (1,2). Several classes of small RNAs, including short interfering RNAs (siRNAs) (3), microRNAs (miRNAs) (4), and Piwi-interacting RNAs (piRNAs) (5), have been identified. MicroRNAs are about 21 nucleotides in length and have been implicated in many cellular processes such as development, differentiation, and stress response (1,2). MicroRNAs regulate gene expression by modulating mRNA translation or stability (2). MicroRNAs function together with the protein components in the complexes called micro-ribonucleoproteins (miRNPs) (2). Among the most important components in these complexes are Argonaute proteins (1,2). There are four members in the mammalian Argonaute family and only Argonaute 2 (Ago2) possesses the Slicer endonuclease activity (1,2). Argonaute proteins participate in the various steps of microRNA-mediated gene silencing, such as repression of translation and mRNA turnover (1). Peters, L. and Meister, G. (2007) Mol Cell 26, 611-23. Filipowicz, W. et al. (2008) Nat Rev Genet 9, 102-14. Caplen, N.J. et al. (2001) Proc Natl Acad Sci USA 98, 9742-7. Mourelatos, Z. et al. (2002) Genes Dev 16, 720-8. Girard, A. et al. (2006) Nature 442, 199-202.